“I’ve never heard of it.” That is what my answer would have been before participating in this internship if I’d been asked what additive manufacturing or microfluidics meant. And truly, I had never heard of such terms before. I still remember on my first day when my supervisor, Paree Allu, started referring to Additive Manufacturing as ‘AM’. I just kept staring at him thinking about the fact that up until that point, I had only been applying the term ‘AM’ to a time convention or a transmitting signal on the radio. Working at Flow Science meant learning something new every day. Whether it was something simple like connecting to metal casting companies over LinkedIn or something complex, such as understanding parameters in a software simulation; I was able to expand my knowledge and professional skills in a real job setting. I am currently working to obtain a Bachelor of Science in Civil Engineering at the University of New Mexico (UNM). You might ask, why would a civil engineer want to work as a computational fluid dynamics (CFD) intern? But then, why not? The level of knowledge gained could not have been greater, and let’s say, knowledge really takes you places. This year I was able to be part of the Science, Technology, Engineering, and Mathematics Talent Expansion Program (STEP) funded by the National Science Foundation. This program provides UNM students an eight-week summer internship with a company/agency or a faculty member at the University. I was also fortunate to be part of the National Migrant Scholars Internship (NMSI) Initiative operated by the Migrant Student Services at Michigan State University. This program identifies and recruits College Assistance Migrant Program students from across the nation, and then matches them with experiential learning opportunities preparing them for future careers. My internship at Flow Science was split into two sectors: Additive Manufacturing and Microfluidics. Additive Manufacturing or AM is a process by which three-dimensional objects are built using a layer-upon-layer approach. Some additive manufacturing processes include direct energy deposition, binder jetting and laser powder bed fusion. FLOW-3D is a CFD software that simulates additive manufacturing processes that help users understand the underlying physics at the micro and meso-scales. Using experimental data such as molten pool dimensions, it is possible to calibrate FLOW-3D models and once calibrated, the software allows users to develop process windows for different kinds of alloys, minimizing the number of experimental runs. Paree and I worked together on calibrating FLOW-3D models using experimental data for laser powder bed fusion processes from the National Institution of Standards and Technology (NIST). The NIST experimental data consisted of a series of tests of laser scan tracks made on a bare nickel-based superalloy, IN625 metal surface. Once we calibrated the models using experimental data from NIST, our objective was to compare how FLOW-3D did against test data for newer process parameters. Daily, I would set up and run these simulations in the software, then analyze and record the results to capture any trends in our data. A total of 40 simulations were run, each taking around 3-4 hours for the calibration and test studies. 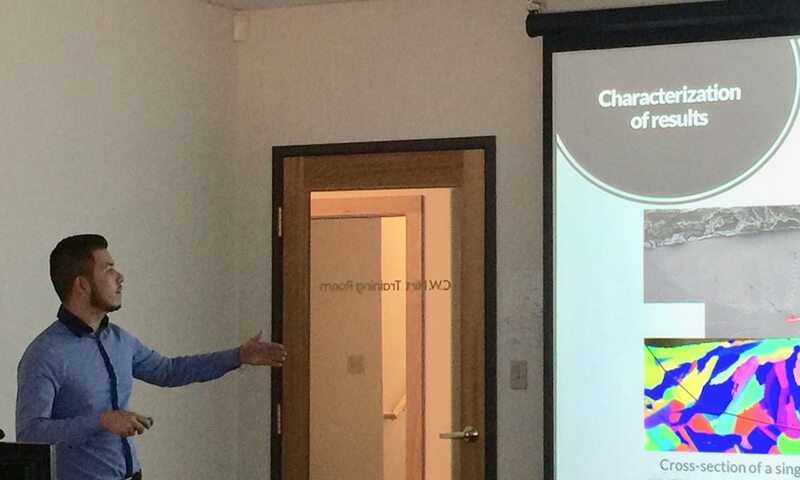 At the end of the internship, I had an opportunity to give a presentation on our findings to the entire company. Not only were we close in matching the simulation results to the experimental data for the test cases, but we also uncovered useful trends in the data that showed how the laser power and scan speeds can affect melt pool length, depth and width in laser powder bed fusion processes. The company also sells FLOW-3D CAST, which is a specialized version of FLOW-3D for metal casting simulations. I had an opportunity to research die casting companies in the Michigan area since our company was heading there to give a presentation at a North American Die Casting Association workshop. I would study the company websites, find contact information and call to see if they would be interested in meeting Paree to talk about how FLOW-3D CAST could bring great value to their company. I still remember how my first call went horribly wrong. Even if it sounds funny, I had to mentally prepare myself. I also wrote a script with the exact words that I was going to use when calling the companies. Let me tell you, I was nervous. I was also able to connect with over 300 users on LinkedIn that specialize in Additive Manufacturing, which for me, sounds ‘kinda’ impressive. Through this exercise, I learned how to communicate technical knowledge effectively over the phone and email since communicating is an important skill for engineers to master. The second part of my internship focused on the research of pneumatic pumping in centrifugal microfluidic platforms. At this point, I started working with Adwaith Gupta, a CFD Engineer at Flow Science. Adwaith is part of the marketing team and oversees the microfluidics industry. Essentially, the same objectives applied as to what I did in AM- validating FLOW-3D results with experimental data. For over 40 years, the centrifugal microfluidic platform, otherwise known as compact discs (CD), has been a research topic in both academia and industry. Currently, CD microfluidics is emerging as an advanced system for lab-on-a-chip (or, lab-on-a-CD) applications primarily geared towards the biomedical industry. Many applications use CD microfluidics, such as rapid diagnostics using immunoassays and plasma separation from blood. Most CDs rely on either application of special surface treatments on the CD surface or on active forces (generated by magnetic or electric devices). These approaches to strictly control the behavior of liquid inside these miniature CDs can be cumbersome because of extra chemicals (surface treatments) or too many devices. Inherently, CDs allow uni-directional flow of liquid due to rotational forces, limiting the real-estate for designing complex immunoassays while maintaining the compactness of the disc. To overcome all these limitations of traditional CDs, the researchers presented an alternate technique for centrifugal microfluidics that uses pneumatic compression. The research consisted of a specially designed fluidic manifold with different compartments. Initially the compartments have air, but on increasing the rotational frequency of the CD, pneumatic compression would increase. By slowing the velocity of the disc, this same pneumatic energy (the energy contained in the compressed air) would be released to then pump fluids back toward the center of the CD, thus overcoming the uni-directional fluid movement. (Wow, I feel amazed for having the ability to explain this process!) Let me remind you that these are very tiny (a few centimeters in diameter) discs with the ability to minimize the many applications normally done in lab, therefore it’s difficult at times to obtain exact data. I set up the simulations, recorded the simulation data, and compared it to the experimental data. This project was presented at the end of the internship to the company. While working with Adwaith, I also had the opportunity to complete a list of about 200 companies around the world that work in the microfluidics industry. The goal of this list is to reach out to these companies and showcase the applicability of FLOW-3D to their work. Certainly, it was a very intense summer. The level of work and commitment at this internship was very high. But, even when it was expected that I put in all my possible time, the willingness to help me was tremendous. As I remember Paree telling me during my interview, “We don’t want you to fail in this program,” and that motivated me to work even harder. During the coming year, I will be part of El Puente Research Fellowship. This program supports and promotes undergraduate research to prepare students for graduate level education over the course of two semesters. This internship gave me confidence for my future work. I feel more prepared, and now, the only thing left to say is thank you!